Enroll Now for New Classes! There's a magic that happens when you fill a room with bright-eyed learners, beautiful instruments and an inspiring teacher. Students explore music, experiment, perform and laugh together. They challenge and support each other to new heights of excellence. The sound of engagement coming from the classroom keeps students coming back year after year. Read more about the many ways group classes keep students engaged and motivated. This one-hour class keeps students engaged and grounded in the building blocks they need to be successful. 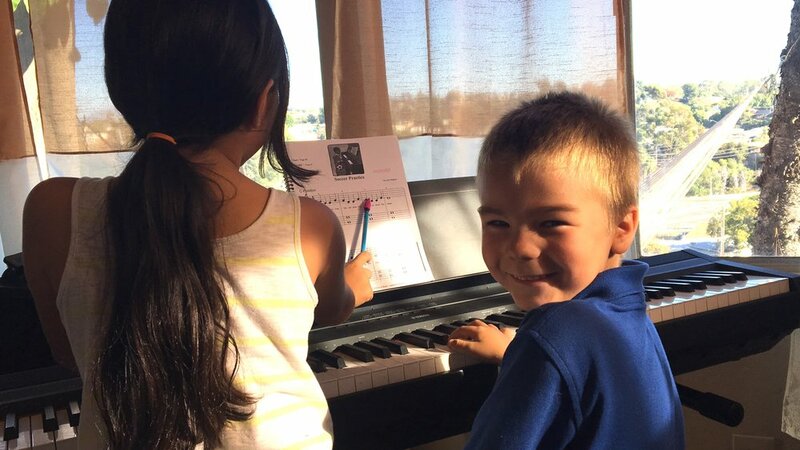 With at least one other "piano partner" students find the learning process so much more fulfilling, exciting and fun. Learn more about the curriculum taught in piano class, Music Makers: At the Keyboard. This video is a condensed version of a Musik Makers At the Keyboard (MMKB) Year 1 class. MMKB written by MUSIKGARTEN and is a group piano class for children from 6 years and above. It is a music & movement program where the objective is to help the students gain musical literacy. Did you know that babies hear in the womb? Listening begins before they're even born! Singing and playing is a part of nurturing a healthy child. At Airshine, music education begins at 2 1/2, and soon we'll be adding baby and toddler classes. In the 45-minute Musikgarten Cycle of Seasons class, children and their caregiver sing, dance, play and move. The family packet supports music making at home and strengthens the family bond. Our beginning students start in a class, to build a solid foundation of listening, singing, playing and reading. After those foundational skills are firmly in place and students are confident in their abilities, they may continue learning in an intermediate class or take private lessons. We offer private lessons in guitar, ukulele, piano, strings, and voice.